University of New Mexico’s President, Garnett Stokes, has announced that UNM School of Law Professor, Henry Weihofen Chair in Law and Co-Dean, Alfred Mathewson, will serve as Interim Chief Legal Counsel for the university beginning June 1, 2018 while the University searches for a permanent hire following the retirement of Elsa Cole. Dean Mathewson has confirmed that he will continue to serve out his current term as a law school co-dean through July 31, 2018. In August, fellow co-dean, Professor Sergio Pareja, will assume the deanship for a new two-year term. “A nation-wide executive search for the Chief Legal Counsel position is currently underway with the assistance of William F. Howard, Esq. with Academic Search, Inc. It is anticipated that the search will conclude by September when a new Chief Legal Counsel is selected. Following the selection of this position, Dean Mathewson returns to the law school and will be teaching in the fall semester. He will also assist with the transition of the new Chief Legal Counsel and serve as a special assistant to me through December 31,” said President Stokes. Dean Mathewson has been a part of the UNM law faculty for over 30 years. He joined the law faculty in 1983 after working as a corporate, securities and banking lawyer in Denver. He was named the Director of the Africana Studies Program in 2013, after having served as Acting or Interim Director since 2009. From 1997 through 2002, he was Associate Dean of Academics at the law school. Mathewson's teaching and research focuses on antitrust law, business planning, sports law, minority business enterprises and corporate governance. “I am grateful and honored to have had the opportunity to serve as co-dean of the School of Law. Over the past year, the University has sought to make my final year as dean a memorable one. I have also greatly enjoyed working with Dean Pareja. I really appreciate the support and encouragement I have received. This is a very special community and I am pleased to be a part of it,” shared Mathewson. For more information on the Office of University Counsel please visit their website. 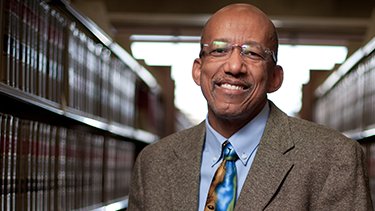 For more information on Professor of Law and Co-Dean Alfred Mathewson, please visit his online faculty profile.